Kyle Abbott claimed his best bowling figures of the season as Hampshire alleviated their Specsavers County Championship relegation worries by claiming a 270 run victory over Nottinghamshire. Fast bowler Abbott posted analysis of four for 36 with Hampshire taking the last six Nottinghamshire wickets before lunch at the Ageas Bowl. The South African, who boasted 60 wickets last season, had struggled with an ankle injury in the early stages of the campaign – but appeared back to his best to use the second new ball to his advantage. Abbott’s quartet of wickets were matched by the equally dangerous Liam Dawson to help hand Hampshire their second Championship win of the year, and condemned Nottinghamshire to their fifth defeat. 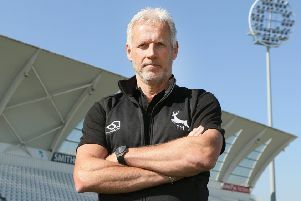 Nottinghamshire had been handed the unenviable task of batting out 96 last day overs to save a draw – having been given an improbable 511 to win. Riki Wessels and Steven Mullaney had started the day unbeaten on 17 and 29 respectively having battled the previous evening after losing four wickets. The pair dealt with the early stages comfortably, with the overcast conditions more helpful for the hosts than the beaming sun the previous evening. Captain Mullaney batted sensibly but naturally punished the wayward balls to keep his score ticking in an 88 runs stand with Wessels. He passed fifty, for the seventh time in his career against Hampshire, from 135 balls but his innings ended after 200 minutes without adding another run. Mullaney attempted to kick away Dawson, who naturally pitched the ball outside leg stump with his left arm spin, but failed to get his hands out the way, with the ball deviating from pad to glove to Gareth Berg at gully. Billy Root only managed to eat up five overs before the part-time spin of Joe Weatherley found him guide a full delivery to Rilee Rossouw at first slip. A further seven overs later, with the new ball taken, Abbott dragged Luke Fletcher outside his off stump, which saw the edge fly to Jimmy Adams at second slip. Amongst the wickets, Wessels played a lone hand with masterclass in mixing batting out for the draw while maintaining his natural instincts. He reached a half century with his 115th delivery with a luscious straight drive. But Matt Carter was undone when he played on to Abbott to leave his off and middle stumps splayed. Abbott swapped ends and wrapped Wessels on the pads with his second ball at the Pavilion End before Dawson claimed his fourth wicket by bowling Mark Footit to complete the victory - and end with figures of 80. Meanwhile, Hampshire overseas quick bowler Dale Steyn was unable to bowl in the Hampshire second innings due to a groin injury. He revealed on his Twitter feed during the morning that while the injury was just a “small tweak, nothing serious” he would miss next week’s Championship clash with Essex.